and the Effect of "Tape Blocking"
tape record as practical. This permits more data per tape, and allows more data records to be written or read per second. Factors of physical memory available, statistics of tape defects per length of tape, and other factors, tend to limit the desirable size of physical tape records. Because computers are so fast relative to physical I/O, the computer time to block and unblock physical records (as in sorting) is considered rather inconsequential. The Effect of "Tape Blocking"
Subject: Re: Question: How many equiv punched cards did a 2400-ft reel hold? Last Wednesday I ran a short program to try and figure this out. The 729-V drive didn't ship until later. The 729-II drive was available with the 1401. The 729-II maximum density was 556 CPI. Do some good record blocking, but still having inter-record gaps... and 441 CPI average sounds like a reasonable number. And Stan’s data ... is a pretty good real-world estimate: about 130,000 cards (65 boxes) per tape reel. I wrote business application programs for the 1401, and selecting a block size for tape files was kind of a balancing act, given the 16,000 character maximum memory size of the 1401. The larger the tape block-size, typically the faster your tape-heavy program would run. But, to write a tape block of, say, 10,000 characters, you need a 10,000 character memory buffer, leaving precious little room for your application program logic. So, we’d typically start with a compromise about double Stan’s blocking factor, say 20 card-images/block, for a block-size of 1600 characters. Consider a typical program which read an old master tape in, updated with add/delete records, and wrote a new master tape out. Our 1460 (a souped-up 1401) had “Tape Overlap”, which sped up run-time, but meant you needed two buffers for the input tape, and two for the output tape. That’s 6,400 characters for the tape buffers, already limiting our program size to about 9K, without considering other working tape files. As the users demanded adding more and more features (hence more memory) to the program logic, we’d reduce the tape block sizes, so we’d often end up more like Stan’s numbers. Funny how Stan always comes out right, doggone him. 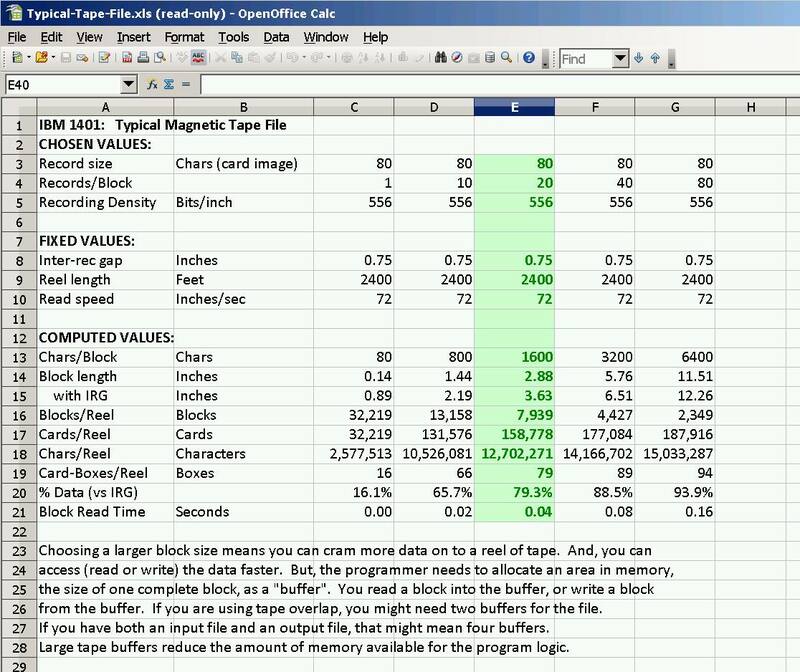 I’ve attached an Excel spread-sheet which computes the capacity of tapes at various card-image blocking factors. Of course, not all tape files had records which were card images, but a card image is a useful rule of thumb. One aside: Sometimes our master tapes grew large enough to require multiple reels. If the programmer (me) could increase the block-size enough to squeeze into a single reel, the operator didn’t have to wait around for the hours-long program to demand he dismount reel #1 and mount reel #2. Instead, the operator could go to coffee. He was very appreciative, and a wily programmer could convert this appreciation to increased computer access time for debugging.